The wartime Home Guard is immortalised in popular culture — but the socialists who shaped it are forgotten. As the “Phoney War” ended in June 1940 with the French government’s capitulation to Germany, Britain was faced with the very real prospect of Nazi occupation. The overstretched and woefully underprepared British Expeditionary Force had taken blow after blow throughout the ill-fated campaign to defend France. Even the later-immortalised evacuation of Allied troops by sympathetic fishermen at Dunkirk appeared in contemporary consciousness as an example of the rudderless British military situation. This rapidly accelerated set of events punctured the British public’s morale, expecting something of a return to 1918 — as did the realisation that the British Army was incapable of overwhelming the highly adept German war machine. In this context of total disruption, the secretary of state for war, Anthony Eden, appealed over the radio for the establishment of a civilian organisation that could mount an armed defence of British soil. Following the chaos of Dunkirk, four hundred thousand people between the ages of fifteen and forty-five put their names forward to join the organisation which soon became known as the Home Guard. Though ostensibly an establishment project, the Home Guard occupied a peculiar space in British society, namely that it was an establishment body founded out of the lack of competent military planning on behalf of the establishment. It was a highly irregular period of British history, where — to quote George Orwell — “Arm the People” was a sensible slogan. It is perhaps unsurprising, therefore, that some on the Left grasped the potential to create, in the nascent structures of the Home Guard, a socialist paramilitary body that could effectively resist Nazism. This was an idea that had germinated several years prior to invasion fever, during the brutality of the Spanish Civil War. The Spanish tragedy was the event that had alerted both the establishment and the rebels to the brutality of modern warfare. Due to the cowering nature of the British ruling class throughout the thirties, it was the Left who took an interest in that very modern conflict; convinced of the slogan that bombers over Madrid would soon mean bombers over London, scores of the politically committed studied Spain as a lesson for a future domestic confrontation with fascism. Figures such as renowned scientist J.B.S Haldane — who could count a son among those fighting in the International Brigades — witnessed the psychological and physical devastation wrought by the fascist bombardment of Republican Spain. His work Air Raid Precautions combined his prior research into the effects of stress on the human body with new observations of human behaviour during fascist air raids and in-depth suggestions on the necessary government provisions. Published by the Left Book Club in 1938, in Air Raid Precautions Haldane sought to address “the ordinary citizen — the sort of man or woman who is going to be killed if Britain is raided [from] the air,” offering chilling practical advice on how best to survive gas attacks, mass bombardment, and other menaces of modern war. Initially ignored by a touchy British establishment hoping to minimise fears caused by the Anschluss between Nazi Germany and Austria, a biographer of Haldane claims with some authority that his new Communist Party of Great Britain (CPGB) membership was due to the seriousness with which the CPGB took war provisions during this period, with mass air raid shelters being a common demand in Communist literature and demonstrations. If people such as Haldane were conscious of defence, then Tom Wintringham was the core figure understanding the necessity of offence. Hailing from the northern fishing town of Grimsby, Wintringham had impeccable radical credentials: as a twenty-two-year-old, he was involved in a military mutiny at the end of World War I. As a history student at Oxford in the early 1920s, his companions were the first-generation Communist intellectuals Andrew Rothstein and Ralph Fox. In 1925, he was jailed alongside eleven fellow Communist officials for sedition, in a move that was intended to disrupt and intimidate the growing rank-and-file trade union movement in Britain. Wintringham fought alongside the Spanish antifascists from very early on, leading the English-speaking Tom Mann Centuria. He was in a unique position to internalise the new intensity of this conflict, experiencing the panicked hand-to-hand combat as well as the fascist forces’ tactic of mass bombardment of cities. He was seriously wounded several times throughout the course of the conflict, his ferocity and tactical intellect being attested to by practically all accounts of the war that mention him. On his return to Britain in 1938, Wintringham was acutely aware of the need for the Allies to drastically improve their military situation. Alongside writing the memoir English Captain in 1939, and authoring several documents on army strategy, his influence grew in earnest with his May 1940 pamphlet How to Reform the Army. While much of the content of How to Reform the Army relates to disavowing the traditional toxicity of the aristocracy-flooded British armed forces, Wintringham also discusses the need for a more lenient internal culture inside the armed forces, of fostering democratic participation and debate amongst the lower ranks. Of particular curiosity to many, however, was the pamphlet’s proposal that the British Army create twelve new divisions structurally identical to the International Brigades, composed of one hundred thousand recruited intensively from the ranks of antifascist ex-servicemen and young idealists that populated the labor movement. The boldness of Wintringham’s ideas turned heads. Despite being dismissed on the outbreak of war by the military establishment, who explicitly refused him an officers’ commission, Wintringham’s apparently marginal views were comfortably sidelined for the first eight months of war. However, the pamphlet gained traction, selling over ten thousand copies in June 1940 alone. It is clear that in this moment of generalised social crisis, the British ruling order was experiencing a real episode of self-doubt. Wintringham’s Leninist sense of political opportunity was uniquely placed. Perceived as something of a renegade among Communist ranks for his advocacy of a Popular Front long before Moscow, Wintringham had gone party-independent, articulating his views on socialism and military strategy for publications associated with the Labour left, such as Picture Post, Tribune, and the New Statesman. In his columns, Wintringham sought to develop a radical British patriotism framed within the dual existential danger that Nazi occupation posed towards both Englishness and socialist politics. Rooted in the notion that the British people as a whole were fighting fascism, his writings excoriated the appeasers who enabled European fascism to spread as far as Britain’s shores; the Tories were the enemies of the people, traitors to the country — in these dishonest times, only the British working class itself could now deliver political salvation. This narrative of condemning the cowardly British bourgeoisie for Britain’s plight was to be found in other sections of the Left, from the Communist intellectual Ivor Montagu’s tight polemics against the “traitor class” to the bestselling book Guilty Men. Signed “Cato” but written by a trio including future Labour leader Michael Foot, Guilty Men had to be reprinted twelve times in July 1940 alone, having sold a quarter of a million copies. However, it must be conceded that Wintringham was the earliest, certainly the most consistent, and probably the most vociferous advocate of this political line of thought. Drawing on his critical understanding, he also offered a military solution. Wintringham argued that a force must be built that could engage in a people’s war for a people’s peace. In Wintringham’s eyes, “one has to treat the building of an army as a political problem,” a question of political ideology where socialist consciousness is nurtured and concrete antifascism enforced. If Britain was to emerge victorious from its darkest hour, the full political mobilisation of the people on the basis of staunch socialist conviction was necessary. In a meeting with Tom Hopkinson, the fellow-traveller publisher who had given Wintringham writing space at the Picture Post, the men agreed upon the idea of establishing a training base for Wintringham to apply his military theory — with a particular focus on the people’s militias that repelled the fascists in Spain. Given that the often-teenage Royal Air Force pilots were fighting to exhaustion over southern England against a seemingly superior foe, the men were interested in immediately building a force in Britain that could repel Nazism; a nationally coordinated, state-funded paramilitary group to be used as the last line of defence, inspired by a grim determination similar to that of the Spanish Republicans. The ninth earl of Jersey offered his Osterley Estate in West London as a training ground, and the British government approved of the effort. Wintringham’s intentions for what sort of force he wanted to create was exemplified by the militants he chose to shape his people’s militia. Vital to the project was the figure of Bert “Yank” Levy. Born to immigrant parents in Canada who first moved to New York and then Cleveland, Ohio, “Yank” had already led a colourful life before arriving at Osterley Park. Having grown up as a street tough and having worked as a professional boxer, Levy fought in World War I, and served in the Middle East. A chance meeting with T.E. Lawrence’s guerrilla fighters inspired him to dedicate his life to the armed struggle, becoming a gun smuggler for the revolutionary forces led by Sandino in Nicaragua. For his alleged involvement in a bank robbery, Levy served a five-year prison sentence in the United States and was ultimately deported to Canada, where it was claimed by Wintringham that he became one of the “most obstreperous leaders” of the Canadian unemployed workers’ movement. Levy arrived in Spain in late 1936 as one of the first international volunteers, and was captured at the Battle of Jarama in 1937, being eventually released in a prisoner exchange. An expert in silent killing, his advisory role to Wintringham — and particularly the brutal, unemotional appeals to combat found in his pamphlet Guerrilla Warfare — made a serious impact on the early Home Guard volunteers and the overall style of the unit. Alongside Levy was Hugh Slater, a Communist who had previously worked for the Comintern before joining the International Brigades as a political commissar; Ferdinand Otto Miksche, an ethnically German Czechoslovakian antifascist who had also fought in the International Brigades and become a leading theorist on countering blitzkrieg warfare; Wilfrid Vernon, an early enthusiast of Mao and a future Labour MP for Dulwich; and the artist Roland Penrose. A leading Surrealist with close relationships to continental communist poets such as Paul Eluard, Penrose was pivotal to the “cultural front” for the Spanish Republic, having organized the British tour of Pablo Picasso’s Guernica in 1938–39, and secured refuge for Robert Capa’s photographic negatives in his London study. The violence learned at Osterley Park was severe and unsentimental, somewhat taking aback older volunteers attuned to more “gentlemanly” forms of military training. Levy taught close combat and precision knife work, while Wintringham taught how to fight in irregular formations, interested in a mountain-based partisan warfare that was so vital in Spain — and potentially in the hills of Lancashire or South Wales. Wintringham also practically applied the egalitarianism he found in the Spanish workers’ militias. In a contemporary interview with the Daily Mirror, he described the egalitarianism of the Osterley Park recruits — “superficially alike in a mixture of uniforms … in shortage of weapons and ammunition, in hasty and incomplete organisation,” but fired with a “serious eagerness” to learn, and to “meet and defeat” all potential difficulties. Despite the severity of their tactics and the adventurous connotations of men such as Levy and Wintringham, a political vision remained central to the project. Levy’s suggested reading for new recruits displays a particularly colourful repertoire, encouraging his volunteers to read Ernest Hemingway’s For Whom The Bell Tolls; Edgar Snow’s pioneering work on the Chinese communists, Scorched Earth; and — for all the romantic socialist-patriotism of Wintringham — Irish Republican Army militant Ernie O’Malley’s poetic memoir of the Tan War, On Another Man’s Wound. Amid this political education were sown the potential structures for a future British resistance movement. 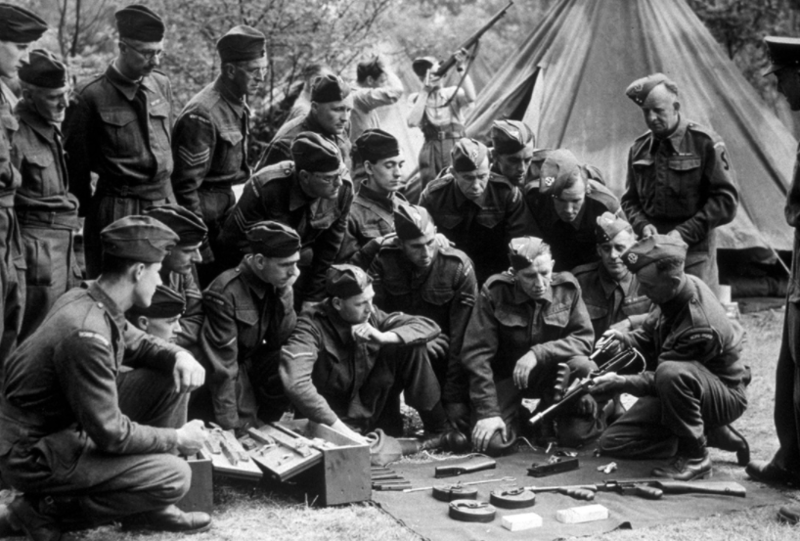 It being suggested that Britain might be overrun, the Osterley Park radicals recommended that in such an eventuality the Home Guard members should bury their rifles and uniforms, return to civilian life, and organise cells of up to three members armed with handguns and explosives. For this, recruits were taught how to safely destroy ammunitions dumps and immobilise military vehicles — as well as how to poison water supplies (by throwing dead dogs into enemy wells). However, by late 1940, invasion fears were largely over. MI5 agents were sick of biting their tongues over the “communistic tendencies” at Osterley Park, and were acutely aware that the recruits may be used in a situation of political instability to fan socialist revolt. As the Luftwaffe ran out of energy in autumn 1940, the British establishment could confidently assert itself again, successively regaining total political control by flooding Osterley Park with loyal military men. Though Wintringham was still working at Osterley Park, he was pushed out of any central role by being appointed as a “consultant,” with Osterley Park being incorporated into a wider group of training centres. The intelligence services began to collect large amounts of material on Wintringham’s people, and aggressive questions were heard in the House of Commons particularly over the continued presence of Hugh Slater from Tory MPs fearful of this former Comintern man’s contact with armed workers. Yet despite their swift removal from the Home Guard, many of its key players helped move the wartime political landscape leftwards. Alongside Liberal MP and Popular Front supporter Richard Acland, Wintringham established the Common Wealth Party, a left-of-Labour grouping with Christian socialist and revolutionary syndicalist undertones. At several by-elections, their radical message resonated with a buoyant British public and the party gained five MPs. Similarly, Tom Hopkinson heavily involved himself in the “1941 Committee,” a grouping of politicians and intellectuals broadly credited with cultivating the political base that allowed the historic Beveridge Report to emerge. Thankfully, the plans of the possible British partisans were never put to the test. Beyond the reassurance of popular 1960s–70s BBC comedy Dad’s Army, which moulded in the public memory a vision of the Home Guard as a bumbling bunch of geriatrics and simple adolescents, it is worth revisiting the cold facts that the blasé attitude the British ruling class took towards fascism placed the country in an extraordinarily dangerous position. In 1940, when Britain was faced with the threat of invasion, the serious vacuum in British defence preparations was filled mostly by the socialists who had been fighting fascism when the right-wing British government had been uninterested. In a country convinced of its own moderation, its “good sense,” and its overall war record, it is extraordinary that at one point in British history, the force that would ultimately repel fascism across the country would have been an armed, inspired mass alternative to fascism — and, ultimately, the British class system itself. Marcus Barnett is associate editor at Tribune.